The compact Stihl RE 98 pressure washer has been designed for general use around the home and garden. It is a handy, well-built tool that is perfect for hosing down the garden deck, washing the windows and cleaning the car. It takes the elbow grease out of those grimy cleaning jobs that have to be done regularly such as sprucing up the patio or de-sanitising the bins. This model comes with two different nozzles so the best one can be selected for the job at hand. The rotary nozzle omits a concentrated and powerful jet of water which lifts dirt very efficiently from a small area. The second nozzle is a fan nozzle which produces a gentler but wider spray of water to wash larger areas. Each nozzle can be used with a variable amount of pressures, and they are attached with a quick-release system so changing them over takes no time at all. Also included with the washer is a detergent bottle which can be attached to the spray lance so a constant supply of de-greasing detergent is added to the water. 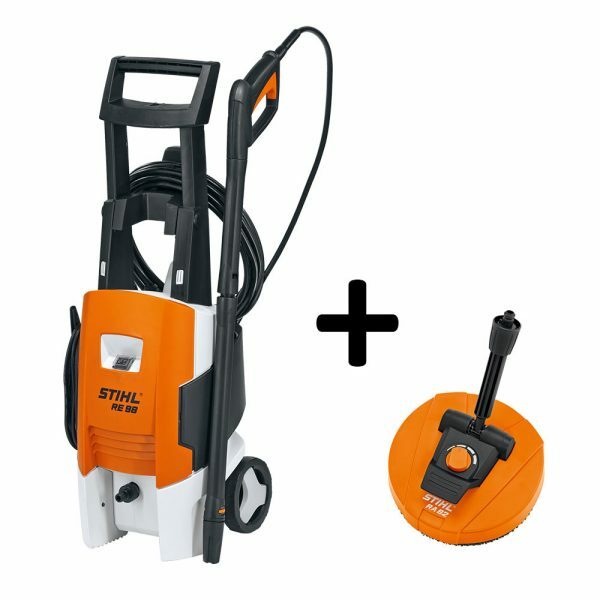 For easy storage, the Stihl RE98 has brackets that have been built into the back and side of the body for the power cable, the hose and the lance. A holder is also available for the nozzles. These added features ensure that everything is kept nicely organised in one place. This particular model sits upright on two wheels and has been designed so it can be manoeuvred around the home easily, even into small corners and narrow gaps. The robust chassis been constructed so that the pressure washer can be transported over longer distances if needed. The high-pressure hose is manufactured from textile mesh and is 6 metres in length giving the user total control when in use. A 5 metre power cable is also provided. The pump and pistons have been produced using aluminium and steel to ensure the machine will perform well for many years. The induction motor has been built to a high standard to offer a quieter running noise with a long service life. To stop the hose becoming entangled when in use, an anti-drill system has been incorporated. A useful and reliable jet washer from the German power equipment manufacturer, Stihl.